WHAT SEPERATES HUMG FENG SHOES FROM THE REST? 1. Practical Design. The minimization of laces and grommets means it ties fast with quick knot and you are done. 2. Nubuck Leather. The upper material is soft in texture and can be folded. Wearing these shoes will make you feel comfortable and flexible. 3. Aggressive Tread On Sole. Most of our shoes are also focused on the designation of treads, they can cope with many walking surfaces from slick floors to icy sidewalks to uneven gravel trail. Then this is the most important outdoor activities, breathable casual shoes you'll ever purchase! NOW is the best time to be massaged to release the stress on your feet and improve blood circulation! - Order Now! 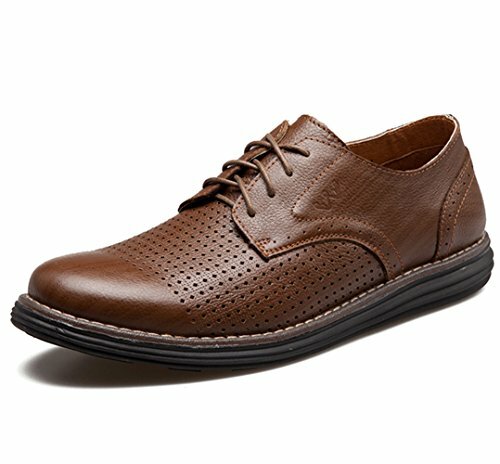 * VERY COMFORTABLE, DURABLE MEN'S CASUAL WALKING SHOES for that fashionable look everyone wants. These shoes are exactly what you should be equipped with if you ever need a casual walk or some outdoor activities. Plus it breathes very well avoiding perspiration and dreaded foot odor. * MADE WITH HIGH QUALITY LEATHER for that fashionable look everyone wants. These feel so good on your feet you won't want to take them off. Walking and even running just seem natural. Yet they look good enough for work or a night on the town. *AGGRESSIVE TREAD ON SOLES MAKE IT HIGHLY SLIP-RESISTANT. We have been fully aware of the importance of anti-skidding, that's why we made these aggressive tread on soles, it prevents many potential risks of falling from slick floors to icy sidewalks to uneven gravel trails, these shoes have the aggressive tread you need for terrific all-round performance. *LOW TOP & LACE UP DESIGN. Great convenience will be brought to you by these two features. How so? 1. The low top is lot more easier to slip into, which also provides great flexibility for the movements of ankles when you are walking or doing outdoor activities. 2. There are no multiple grommets and long laces to spend more efforts on when you tie the shoes, yet the conservation of laces allow you to fasten according to your needs. *100% MONEY BACK GUARANTEE makes these shoes your #1 choice for an excellent no-risk purchase. Many people are buying 2 pair so they have one for work and formal and another for play and athletics. If it is not your favorite shoes you have ever owned, the most stylish and the coolest, even for your friends, family and co-workers, return it for a full refund, no question asked. HURRY AND BUY NOW while we still have these in stock. If you have any questions about this product by HUMGFENG, contact us by completing and submitting the form below. If you are looking for a specif part number, please include it with your message.